Cardbomb: #TGIFC140 - Anything Goes! Hello! Oh, boy do I ever have some exciting news today... I have been asked to join the amazing design team over at TGIF Challenges and this is the first week that I am joining them! If you are new to my blog, Hi! I'm Maria and I'm a Stampin' Up! demonstrator from a tiny mountain town in California, USA called Boulder Creek. I love stamping, paper crafting and sharing fun ideas. I'm glad to have you stop by today. It's such an amazing week for me to have my first challenge this week as it is "Anything Goes!" Not only that, but if you decide to play along as a challenger you get to case any one of the design team members-Your Choice! 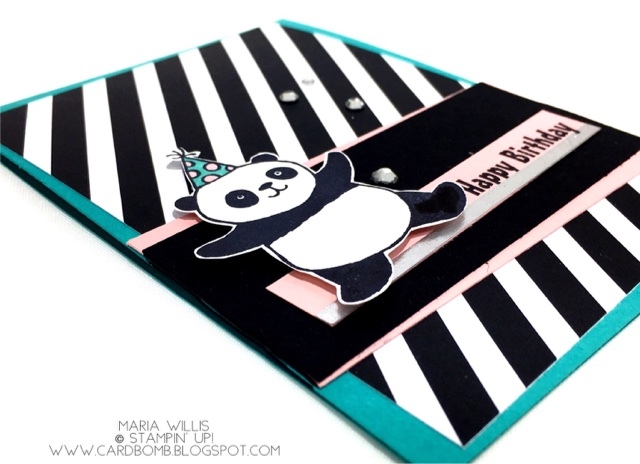 For this challenge I've made a fun little notecard sized Birthday Card using the soon to be released Party Pandas stamp set. I love this stamp set and look forward to making many a birthday card with it. I've layered some black and white striped paper onto a background of Bermuda Bay. The layers are Pink Pirouette, Basic Black and Silver Washi. 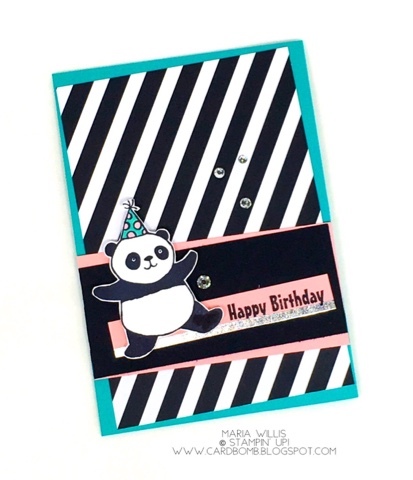 The Panda's cute little party hat was colored with the lighter shades of my Bermuda Bay and Pink Pirouette Stampin' Blends Markers. After popping the Panda up with dimensionals I added a couple of rhinestones just for good measure and called it done! 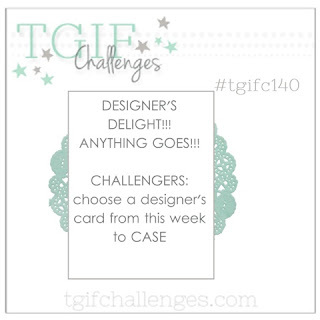 I hope you'll head on over to the TGIF Challenge Blog to play along with us for #TGIFC140. It doesn't get much better than the freedom to choose that this week's challenge has to offer. I can't wait to see which designer you'll choose to case and what creativity you'll share with us. That's it for today folks. I hope you're enjoying your holidays and spending lots of time with your loved ones. Take care and I'll see you back here soon. What an adorable card Maria! I love the colors you chose and the little bits of glimmer and shine!!! So adorable. I love those Pandas. Thank you so much! Those Party Pandas are pretty cute, aren't they? Love your card! I chose to case it for this week's challenge! That is the hugest compliment! Thank you Jennie!